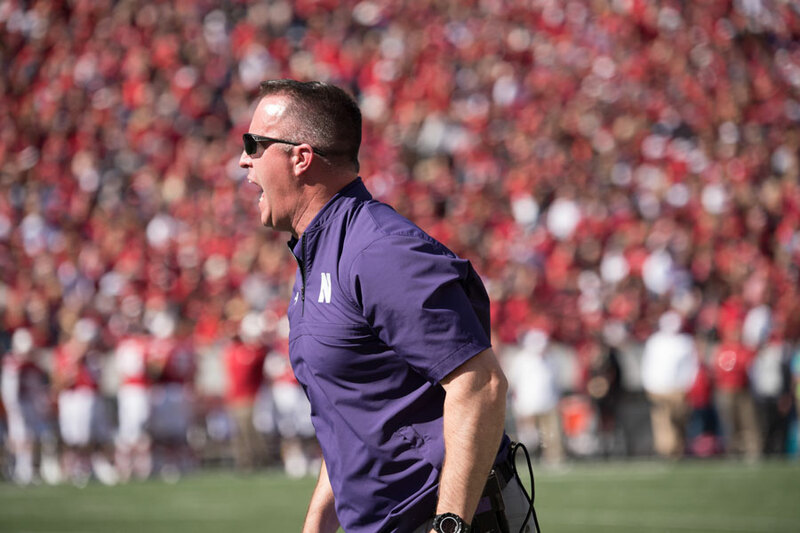 Pat Fitzgerald yells. The coach railed against NCAA guidelines about official gameday tackling statistics this week, claiming redshirt freshman linebacker Paddy Fisher had more tackles than he was credited for against Michigan State. Paddy Fisher, coach Pat Fitzgerald asserted, actually had 21 tackles against Michigan State. The official statistics, compiled in real time in the press box, credited the redshirt freshman linebacker with 17. But Fitzgerald dismissed that collection method this week. In an extended answer about the discrepancy between the official number and the one determined by Northwestern’s (5-3, 3-2 Big Ten) coaches, Fitzgerald emphasized several times that the spotters making tackling determinations were not at fault. Noting that he often can’t see who made tackles in real time, he mused over how someone in the press box could make every statistical determination in a split-second. Instead, he blamed NCAA guidelines regarding the collection of official defensive stats. Sometime during the week, the official statistics changed: Fisher is now credited in the box score as tallying 19 tackles. Either way, Fisher had a superb day. His 17 official tackles, as of Monday, still led the Wildcats by a large margin and earned him a pair of awards: Walter Camp FBS Defensive Player of the Week and Big Ten Defensive Player of the Week. The linebacker, for his part, played down the numbers. His coach was adamant, though. When asked by a reporter to clarify that Fisher would officially get credit for 17 tackles despite the coaches’ determination, Fitzgerald had a simple answer. Asked in the 1995 media guide what one thing he could change in the world, Fitzgerald, then a junior linebacker for the Cats, said he wanted a dome over Ryan Field. A week ago, he jokingly confirmed that he still desired a covering, though he would prefer a retractable roof. This week, players seemed less excited about the possibility. Senior receiver Macan Wilson said it “would be kind of cool,” but Fisher quickly shot down the idea and junior guard Tommy Doles was similarly uninterested. NU’s coach commended the atmosphere at Nebraska’s Memorial Stadium, which has been sold out for 359 consecutive games. His assertion is a credible one, given the sellout streak at the 85,458-seat stadium began in 1962. Fans continue to pack the bleachers despite recent rough patches by the Cornhuskers’ high standards — like a 5-7 regular season in Mike Riley’s first year in 2015 and an absence of 10-win campaigns since 2012.